Individually constructed in our Flinders Park Factory, every Shadeform sail is tailor made to combine the best of strength, durability, and appearance. 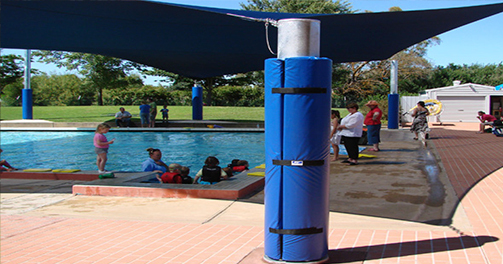 Each sail comes with stainless steel fixings and fittings, SS edge wires, welded seams, and is 3-D computer designed. 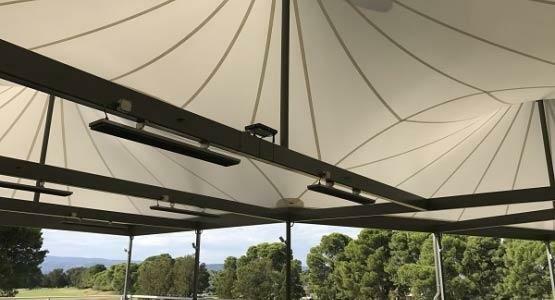 With the ability to be retracted, the Shaderunner® is a versatile shading solution, perfect for outside areas where control of light and heat is beneficial. 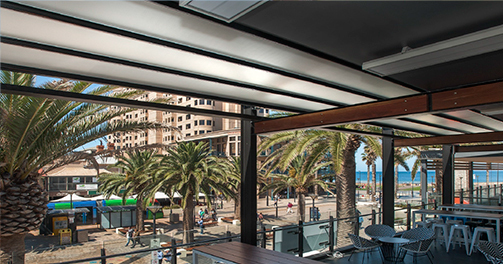 This option creates a flexible use of space, which is cool and shaded when fully extended or warm and sunny when retracted. Created by tensioning a PVC or Mesh fabric over a metal frame, the translucent fabric forms a well lit area using natural light. 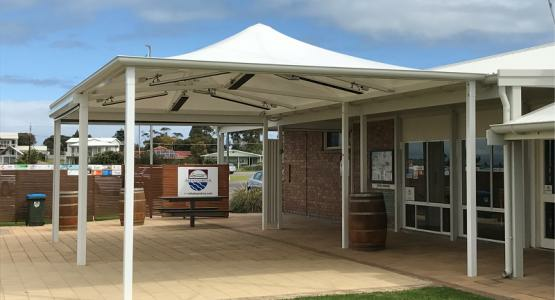 This premium custom framed canopy provides all-weather protection which is comfortable and designed with aesthetic features in mind. 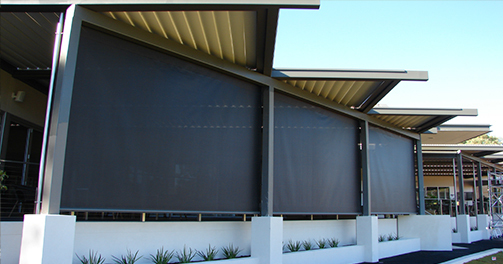 External Roller Blinds and Blackout Screens provide a long list of benefits to commercial buildings and residential exteriors. 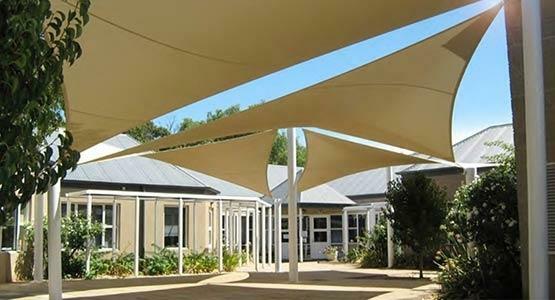 Whether it’s privacy, sun protection, heat reduction, or energy savings, Shadeform can provide you with the right solution for your unique situation. 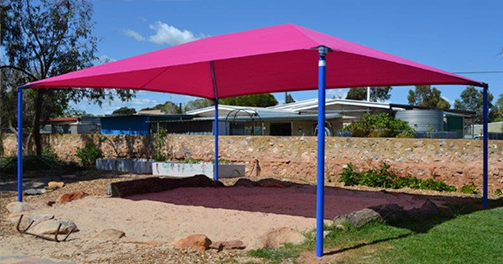 The Issey range of Australian made Awnings are versatile, flexible, and have a minimal form factor. 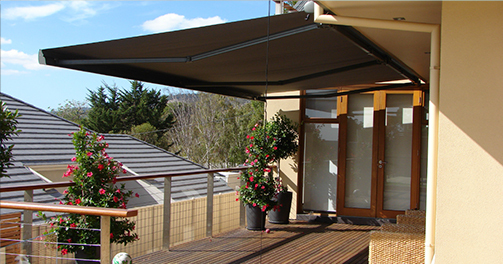 A Folding Arm Awning is perfect for decks and patios, where an unobstructed view is preferred. 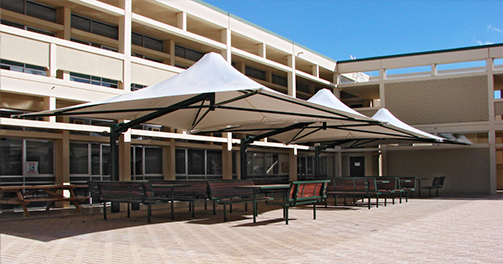 A Drop-down Arm Awning is also available, for alternate shading requirements. 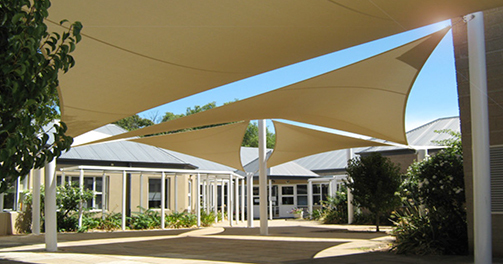 For larger areas, take advantage of the slim line roller track awnings - Issey Maxisun and Issey Fabric Tension System. 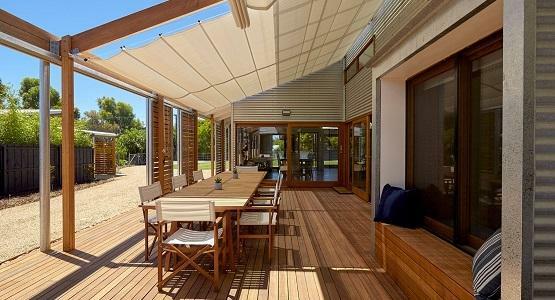 The ultimate in weather protection, a Retractable Roof is unsurpassed in comfort, style, and design. 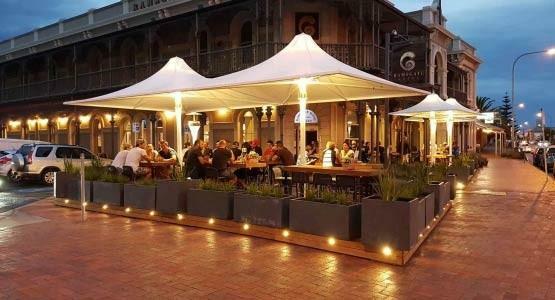 The flexible all-weather fabric canopy, combined with a motorised track and runner system, creates fully protected alfresco areas that are integrated with the existing building. 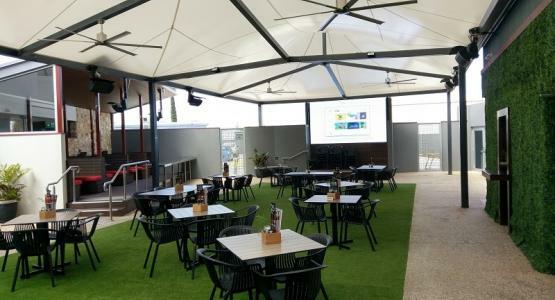 By installing a Retractable Roof you can ensure maximum use of outside space and add value to your home, business, or workplace. 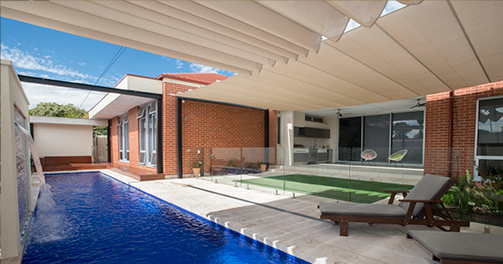 The Flexshade Umbrella provides visually stunning outdoor sun and rain protection. 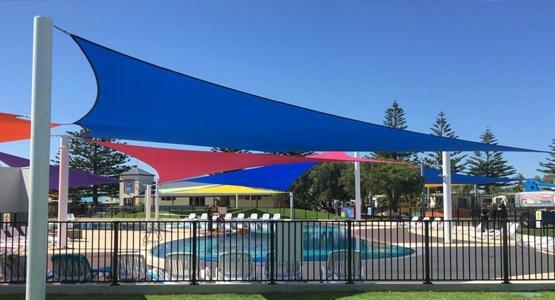 Permanently fixed to a large concrete footing, all Flexshade Umbrellas are wind rated to 160 km/h, structurally guaranteed for ten years, and designed and built here in Australia. 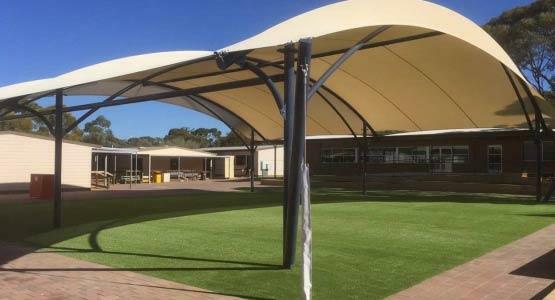 Using a hip-roof steel frame with a wire tensioned commercial shadecloth, this uniquely designed structure is low cost and low maintenance, made for schools and councils. 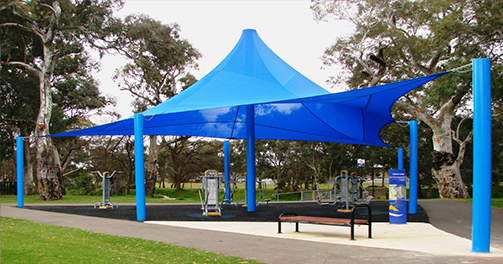 Standard engineering is included with a range of powder-coating and fabric colour options, creating overall features that are stylish, economical, and long lasting. Shadeport is a registered trademark, owned and operated by Shadeform. 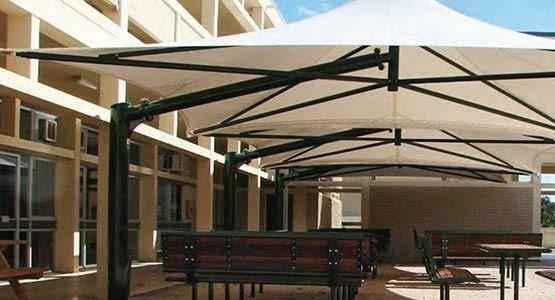 Flexible polyester and PVC textile fabrics allow fantastic design freedom and unique aesthetics for outdoor sun and rain protection. 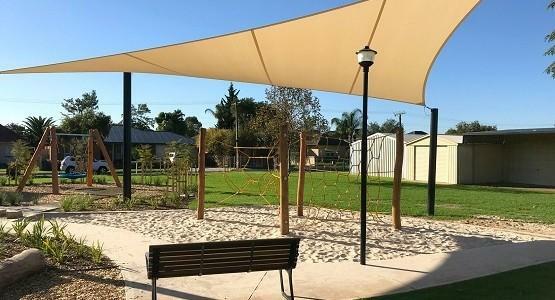 Shadeform can design custom shade structures in a variety of shapes and layouts - perfect for large or unique areas. 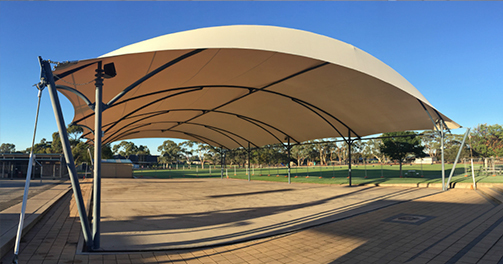 Shadeform’s extensive background in large commercial settings, combined with 30 years of refined sailmaking knowledge, create the perfect conditions for manufacturing and installating high quality Custom Shade Structures, that stand the test of time.